Faye, 20th-century pathologist. See: Puchtler-Sweat stains. 1. Perspiration (3), especially sensible perspiration. (swet) perspiration; the clear liquid secreted by the sweat glands. a. To excrete (moisture) through a porous surface, such as the skin. b. To excrete (wastes) in perspiration: sweated out the toxins in the steam room. 1. The excretion of fluid by the sweat glands of the skin. 2. All fluid loss through normal skin, whether by sweat gland secretion or by diffusion through other skin structures. n perspiration. A clear liquid exuded or excreted from the sudoriferous glands. It possesses a characteristic odor and is slightly alkaline, salty to the taste, and, when mixed with sebaceous secretion, acidic. Sweating is under the control of the sympathetic nervous system, although it may be stimulated by parasympathetic drugs. Thermoregulatory sweating is influenced by the blood temperature's affecting the nervous centers and by reflexes associated with heat receptors in the skin. 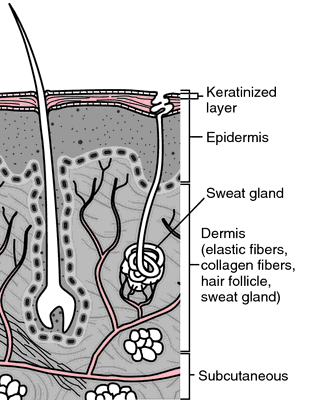 the excretion of the sweat (sudoriparous) glands of the skin; perspiration. Sweating produces an evaporative cooling of the body, the importance varying between species, and also serves an excretory function. Substances eliminated in sweat include water, sodium chloride and small amounts of urea, lactic acid and potassium ions. In humans the ability to lose heat by sweating is much greater than that in domestic animals. Cattle have a high sweat rate (150 g/m2/h at 40°C), sheep lose less (32 g/m2/h) and dogs lose an insignificant amount. Horses probably have the highest sweat rate of all. Excessive sweating is called diaphoresis, hyperhidrosis. called also atrichial sweat gland; see sweat glands (below). Morrelia aenescens, M. hortorum, M. simplex. the glands that secrete sweat, situated in the corium or subcutaneous tissue, and opening by a duct on the surface of the body. They are of two types: (1) the ordinary or eccrine sweat glands are unbranched, coiled, tubular glands that promote cooling by evaporation of their secretion. They are innervated by cholinergic nerve fibers; (2) the apocrine sweat glands are large, branched, specialized glands that empty into the upper portion of a hair follicle instead of directly onto the skin surface, and have no secretory innervation but are sensitive to epinephrine in the bloodstream. Called also sudoriferous, or sudoriparous, glands. a semicircular band of metal with a handle to be dragged over a horse's skin like a squeegee to remove excess moisture quickly. Q. why do we sweat? I don't mean to ask that we sweat when we do physicall activity or are stressed. My question is, why does the body sweat. A. simple energy calculation will do- when our cells work they create energy. most of that energy transforms to other types we use in all sort of ways. but some of it is "wasted" as heat (although some of the time we use it to maintain regular body heat). when our temperature rises it creates an interference with our protein's function, this could be dangerous- so our body rises the blood flow to the skin and causes sweating. the sweat get's the heat energy from the skin and vaporizes thus reducing the temperature. Q. can I locate an otc test for diabeties 2? I'm 60 overweight. don't urinate freq but starting sweating excessiv I do have swelling in my legs and ankles which is new along with the sweating.Sweating occurs at odd times, not with exercise or movement. I just start sweating. No excessive thirst either. Any suggestions? Insurance is a problem. I'm a small business owner. I have to open and close shop. Long lines at the county hospital are for people with time. I just don't have any. I'm beginning to understand why people go out in different ways. thanks any otc advise would be great or maybe a preventive diabetics diet suggestion? Q. does flaxseed work for hot flashes.is there anything else that helps? going though menopause without hormones. A. There have been some researches lately to see if flaxseed does indeed help with hot flashes. flaxseed was studied because it is a phytoestrogen (plant-based estrogen source). Flaxseed contains lignans and omega-3 fatty acids. The research found that it helped some of the women. You need to crush the flaxseed before you eat it in order to get all the oil out of it. You can try it, it is good for you anyway. Eccrine sweat is mostly water, but contains glycoproteins (notably interleukin 1), lactic acid, sugars, amino acids and electrolytes. Losing weight reduces the amount of sweat too (only if you are overweight to begin with). After analysing the facial expressions of the smell group, the research team concluded that there does, in fact, appear to be a so-called"behavioural synchronisation" between a sweating person's emotional state, the sweat generated, and the reaction of the person who sniffs that sweat. In my book Sweat Therapy: A Guide to Greater Well-Being, I encourage people to explore culturally specific sweat practices that are consistent with their own background. Sweat testing by pilocarpine iontophoresis using the Wescor Macroduct Sweat Collection System (Wescor, Inc, Logan, Utah) method is used in Texas Children's Hospital. Most people produce about a litre of sweat each day, but people with hyperhidrosis (about two to three percent of the population), can produce up to 10 times as much. Sweat caused by physical activity (internal thermal stress) and environmental heat (external thermal stress) are produced by secretions from the eccrine sweat gland, while stress (emotional) sweat is produced by secretions from the eccrine and apocrine gland, and as this sweat mixes with bacteria on our skin, the result is a distinguishably foul odour," she said. miraDry has undergone multiple clinical studies and clinical data shows that patients treated with the miraDry procedure effectively experienced a reduction in the amount of sweat produced, and that two years post-treatment, sweat reduction and quality of life factors were sustained. In their study, the scientists at the Rockefeller University and the Howard Hughes Medical Institute devised a strategy to purify and molecularly characterize the different kinds of stem cell populations that make up the complex sweat duct and glands of the skin. In their study, published in Cell, the scientists devised a strategy to purify and molecularly characterize the different kinds of stem cell populations that make up the complex sweat duct and glands of the skin. Those who experience hyperhidrosis (excessive sweating) also can try prescription-strength antiperspirants and prescription pills that can decrease sweat production temporarily, but the medication sometimes can result in dry mouth and eyes as side effects.